Portland Mountain Rescue is a non-profit, volunteer organization dedicated to saving lives through rescue and education. Our search and rescue area stretches nearly 4,000 square miles with 1,000,000 in population. For the most part, our missions occur on Mount Hood, Oregon’s tallest peak at 11,239 feet above sea level. Portland Mountain Rescue is one of the many mountain rescue units in the country that function under the auspices of the international Mountain Rescue Association (MRA). These subsidiary units, like Portland Mountain Rescue, consist of a volunteer group of highly skilled climbers and enthusiastic support resources that are dedicated to getting people out of trouble in mountainous and high-angle areas. Our members, numbering over 70 strong, serve in a variety of roles, while working toward a single goal – saving lives. PMR specializes in search and rescue (SAR) operations involving high angle rock, snow, and ice. Occasionally, we also assist in SAR missions below the timberline in mountainous terrain. PMR provides search and rescue services mainly in the mountainous and high-angle areas of a three-county area of Northwest Oregon and Southwest Washington stretching nearly 4,000 square miles with over 1,000,000 in population. 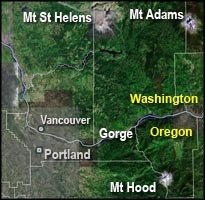 For the most part, our missions occur on Mount Hood, Oregon’s tallest peak at 11,239 feet above sea level. However, we occasionally participate in SAR operations ranging from Central Oregon to the North Cascades in Washington, as well as other parts of the Pacific Northwest. Several stories on PMR missions from around the area may be viewed in the Headlines section. Our SAR missions are coordinated through the Sheriff’s office in the county where the operation is taking place. Generally, the County Sheriff receives a 911 dispatch, evaluates the situation and, if necessary, mobilizes Portland Mountain Rescue or another SAR organization. Occasionally, a PMR member will encounter an unreported accident while in the backcountry. In these cases, the PMR member must contact the Sheriff’s office as soon as possible to establish a formal rescue mission and mobilize other emergency services. PMR is a non-profit, volunteer organization. All funding is derived from individual donations, grants and other types of fundraising. We do not receive financial support from the government. Team members do not receive compensation for their work and are not reimbursed for their expenses whatsoever. Our members spend countless hours of their free time – and occasionally their work time – training and learning so that they will be ready to respond to a search and rescue operation on a moment’s notice. Our funding needs fall into three categories: operating expenses, field equipment and educational resources. PMR maintains an operations vehicle, utilizes specialized mountain rescue equipment and performs a number of valuable community services free-of-charge. All members must have their own basic mountaineering and climbing equipment. Our existence is a direct response to a way of life for untold thousands of people living in the Pacific Northwest who cherish their right to actively experience the freedom of the hills. The Cascade Range mountains and much of the surrounding region is a vast wilderness with inviting, but dangerous, topography. Mount Hood, for instance, is one of the most climbed mountains in the world, but its many glaciers, steep terrain and unpredictable conditions can quickly overwhelm an inexperienced hiker or even an experienced climber who is unfamiliar with the mountain. When accidents occur, volunteer groups like Portland Mountain Rescue are asked to help carry out search and rescue operations. Without volunteer SAR teams, the cost of an average rescue in manpower, equipment, helicopters, etc., would be totally prohibitive. The local authorities in these remote areas have neither the resources nor the funding to maintain a staff of search and rescue professionals. If the local government, Sheriff or Forest Service had to absorb the full cost of SAR missions, many of our most beloved mountains would have to be closed to the public. By providing a volunteer group of technically trained climbers for search and rescue work, organizations like Portland Mountain Rescue help to keep our mountains open for all to enjoy. For more information, please visit either the Getting Involved page or the Team Structure page.